Canning Leek and Potato Soup - Canning Homemade! As many of you read from my Facebook page I finally harvested the leeks in my garden and had five pounds of "what am I going to do with all of this?". This is the main reason I started canning now over a year ago in anticipation of having more crops than I can eat in one or two meals. I turned to my sources of inspiration, my readers, my followers, and my Ball Book and decided to can the start of a potato leek soup. Now when I say "start" it just means that I am Pressure canning the vegetables in a stock with a few herbs so that when I want to serve it I can add my starch, creams, or pastas which can not be canned with the soup. During the pressure canning process one of the lids did not go on straight so the jar never sealed. I put that one in the refrigerator and will make some soup for dinner or take it for lunch at work. I tasted the cooled version and the leeks tasted fantastic. I used a chicken stock as my liquid and it had just the right amount of salt to enhance the flavor of the leeks. The potatoes were fork tender and not mushy which means I cut them to the perfect size, 1/2" chunks. Here is the basic recipe/process for making this soup. 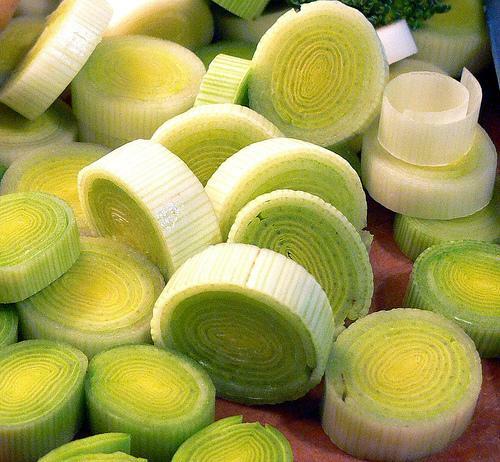 Soak the leeks in cold water to make sure they are clean. Cut into rings and set aside. Peel and cube potatoes soak in cold water till you are ready to can. This will keep them from turning brown. In hot jars, put at the bottom a layer of the leeks then a layer of the potatoes then top the jar off with a final layer of the leeks. Add boiling hot chicken stock filling the jar to 1" headspace. Using the rubber spatula remove air bubbles and then fill with additional stock to reach the 1" headspace covering the vegetables. Process all the rest of the vegetables in the same way for the rest of the jars. When complete process in pressure canner for 60 minutes at 11 pounds of pressure (processed at sea level see below for adjusted times) for dial gauge and 10lbs of pressure for weighted gauge. If you use quarts instead of pints process for 75 minutes. Always make sure that you let your pressure canner vent steam for the full 10 minutes before putting on the weight gauge or pressure regulator. This allows the internal temperature of the canner to rise and produce the pressure needed to reach the 240 degrees needed to kill the bacteria. If you are at higher levels please refer below to the increments of additional pounds of pressure to can these vegetables. * At altitudes of 0 - 2000 feet, process at 11 pounds pressure. * At altitudes of 2001 - 4000 feet, process at 12 pounds pressure. * At altitudes of 4001 - 6000 feet, process at 13 pounds pressure. * At altitudes of 6001 - 8000 feet, process at 14 pounds pressure. * At altitudes of 0 - 1000 feet, process at 10 pounds pressure. * At altitudes above 1000 feet, process at 15 pounds pressure. I also harvested my potato box since the plant was dying. I was bummed that the experiment didn't work as long as I wanted it to but I did get about 3 pounds of new red potatoes that were super creamy. I roasted some of them with a bit of olive oil and rosemary and had a few of the baby size ones left so I canned them along with the potato leek soup in the canner.